Editor’s Note: PolitiFact.com is a project of the St. Petersburg Times that aims to help you find the truth in politics. Every day, reporters and researchers from the Times examine statements by members of Congress, the president, etc. They research their statements and then rate the accuracy on their Truth-O-Meter. President Obama after six months: 32 promises kept, 7 broken and 300-plus still to work on – according to PolitiFact.com. 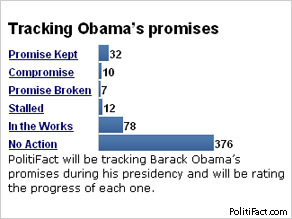 But when you step back and look at all 515 promises that we’re tracking, it’s clear that Obama still has a huge to-do list: Of the 515, we’ve rated 32 Kept, seven Broken and 10 Compromise. A whopping 376 are still rated No Action. Monday (July 20, 2009) will be six months since Obama took the oath of office. He has wrestled with the most severe economic crisis since the Great Depression, but as we noted in February, he used the crisis as an opportunity to fullfill many of his campaign promises through the $787 billion economic stimulus bill. 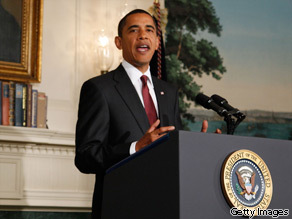 President Barack Obama talks about health care at the White House on July 17, 2009 in Washington, DC. We’ve heard lots of talk about health care reform over the past few months, but this week we got the actual bill to look at. On Tuesday, Democrats in the U.S. House of Representatives introduced major legislation to overhaul the nation’s health care system. The 1,000-plus page bill, called America’s Affordable Health Choices Act of 2009, includes most of President Barack Obama’s key proposals on health reform. That kicked off a flurry of activity on our Obameter. We moved 10 of the president’s campaign promises from No Action to In the Works. We’ll likely find a few more to move as the legislation works its way through the process. 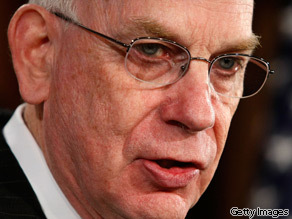 Sen. Robert Bennett (R-UT) speaks during a news conference on the economic stimulus package on Capitol Hill January 29, 2009 in Washington, DC. “The Obama administration has spent millions of taxpayer dollars for roadside signs to tout the economic stimulus.” Robert Bennett on Wednesday, July 15th, 2009 in a news release.